Often people use their mobile phones for texting, browsing, searching and emailing while walking. To avoid collision with other objects, animate and inanimate, or to avoid obstacles and holes on the ground, it is necessary for them inconveniently to occasionally divert their attention to their surroundings. Still , mishaps happen. 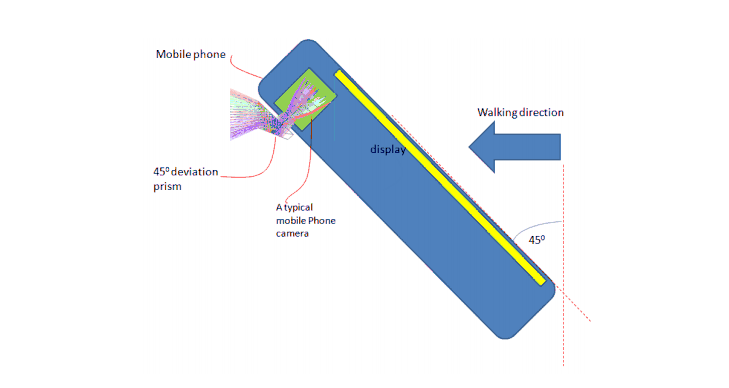 The solution is to have the video camera used while walking so the field of view in front of the walker is shown on his phone display. While solutions under “walk N talk” are sold, they require the walker to hold the camera at its vertical position which is not convenient. 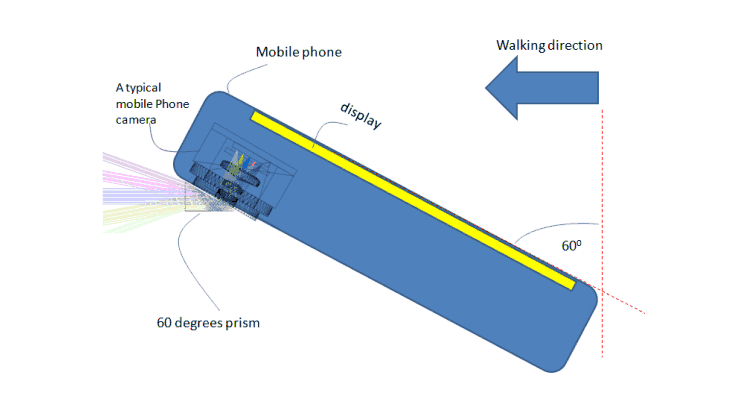 This invention provides for a specially designed small prism placed in front of the camera to allow walking and texting while the scene in front of the walker is shown on his video camera and the camera is held at a convenient angle of 45 degrees using a 45 degree deviating prism or 60 degrees from the horizon using a 60 degree deviating prism. The prisms are treated to prevent them from generating ghost images. Means for easy placing and removing the prisms are disclosed.